Researchers at the Institute of Bioengineering and Nanotechnology (IBN) have developed a simple method of organizing cells and their microenvironments in hydrogel fibres. Their unique technology provides a feasible template for assembling complex structures, such as liver and fat tissues, as described in their recent publication in Nature Communications1. "Our tissue engineering approach gives researchers great control and flexibility over the arrangement of individual cell types, making it possible to engineer pre-vascularized tissue constructs easily. This innovation brings us a step closer toward developing viable tissue or organ replacements." "Critical to the success of an implant is its ability to rapidly integrate with the patient's circulatory system. This is essential for the survival of cells within the implant, as it would ensure timely access to oxygen and essential nutrients, as well as the removal of metabolic waste products. Integration would also facilitate signalling between the cells and blood vessels, which is important for tissue development." Tissues designed with pre-formed vascular networks are known to promote rapid vascular integration with the host. Generally, pre-vascularization has been achieved by seeding or encapsulating endothelial cells, which line the interior surfaces of blood vessels, with other cell types. In many of these approaches, the eventual distribution of vessels within a thick structure is reliant on in vitro cellular infiltration and self-organization of the cell mixture. These are slow processes, often leading to a non-uniform network of vessels within the tissue. As vascular self-assembly requires a large concentration of endothelial cells, this method also severely restricts the number of other cells that may be co-cultured. Alternatively, scientists have attempted to direct the distribution of newly formed vessels via three-dimensional (3D) co-patterning of endothelial cells with other cell types in a hydrogel. This approach allows large concentrations of endothelial cells to be positioned in specific regions within the tissue, leaving the rest of the construct available for other cell types. The hydrogel also acts as a reservoir of nutrients for the encapsulated cells. However, co-patterning multiple cell types within a hydrogel is not easy. Conventional techniques, such as micro-moulding and organ printing, are limited by slow cell assembly, large volumes of cell suspension, complicated multi-step processes and expensive instruments. These factors also make it difficult to scale up the production of implantable 3D cell-patterned constructs. To date, these approaches have been unsuccessful in achieving vascularization and mass transport through thick engineered tissues. To overcome these limitations, IBN researchers have used interfacial polyelectrolyte complexion (IPC) fibre assembly, a unique cell patterning technology patented by IBN, to produce cell-laden hydrogel fibres under aqueous conditions at room temperature. Unlike other methods, IBN's novel technique allows researchers to incorporate different cell types separately into different fibres, and these cell-laden fibres may then be assembled into more complex constructs with hierarchical tissue structures. In addition, IBN researchers are able to tailor the microenvironment for each cell type for optimal functionality by incorporating the appropriate factors, e.g. proteins, into the fibres. Using IPC fibre assembly, the researchers have engineered an endothelial vessel network, as well as cell-patterned fat and liver tissue constructs, which have successfully integrated with the host circulatory system in a mouse model and produced vascularized tissues. The IBN researchers are now working on applying and further developing their technology toward engineering functional tissues and clinical applications. Nature Communications, (2013) DOI: 10.1038/ncomms3353. CHD5 has previously been proposed as a tumour suppressor, acting as a brake that prevents healthy cells from developing into cancer cells. But the part played by the protein in healthy tissue, and whether this role is important for its ability to counter tumour growth, has remained largely uncharted. Working with colleagues at Trinity College in Dublin and BRIC in Copenhagen, researchers at Karolinska Institute have revealed its function in normal nervous system development and as a tumour suppressor. The recently published study shows that when stem cells approach the final phase of their specialisation as neurons, CHD5 begins to be expressed at high levels. CHD5 can reshape the chromatin, in which DNA is packed around proteins, and in so doing either facilitate or obstruct the expression of genes. Ulrika Nyman, postdoc researcher in Dr Johan Holmberg's research group and one of the main authors of the current study, explains that on switching off CHD5 in the stem cells of mice embryos during the period in which the brain develops and the majority of neurons are formed, they found was that without CHD5, a stem cell is unable to silence the expression of a number of stem cell genes and genes that are actually to be expressed in muscle, blood or intestinal cells. They also observed an inability in the stem cell to switch on the expression of genes necessary for it to mature into a neuron, leaving it trapped in a stage between stem cell and neuron. The gene that codes for CHD5 is found on part of chromosome 1 (1p36), which is often lost in tumour cells in a number of cancers, particularly neuroblastoma, a disease that strikes almost only children and which is thought to arise during the development of the peripheral nervous system. Neuroblastoma lacking this section of chromosome and thus also CHD5 are often more aggressive and more rapidly fatal. Treatment with retinoic acid can make immature nerve cells and some neuroblastoma cells mature into specialised nerve cells, but when the researchers prevented neuroblastoma cells from up-regulating CHD5, the tumours no longer responded to retinoic acid treatment. "In the absence of CHD5, neural tumour cells cannot mature into harmless neurons, but continue to divide, making the tumour more malignant and much harder to treat," says Dr Holmberg at the Department of Cell and Molecular Biology. "We now hope to be able to restore the ability to up-regulate CHD5 in aggressive tumour cells and make them mature into harmless nerve cells." A decade ago, gene expression seemed so straightforward: genes were either switched on or off. Not both. Then in 2006, a blockbuster finding reported that developmentally regulated genes in mouse embryonic stem cells can have marks associated with both active and repressed genes, and that such genes, which were referred to as "bivalently marked genes", can be committed to one way or another during development and differentiation. This paradoxical state — akin to figuring out how to navigate a red and green traffic signal — has since undergone scrutiny by labs worldwide. What has been postulated is that the control regions (or promoters) of some genes, particularly those critical for development during the undifferentiated state, stay "poised" for plasticity by communicating with both activating and repressive histones, a state biologists term "bivalency." A study by researchers at the Stowers Institute for Medical Research now revisits that notion. In this week's advance online edition of the journal Nature Structural and Molecular Biology, a team led by Investigator Ali Shilatifard, Ph.D., identifies the protein complex that implements the activating histone mark specifically at "poised" genes in mouse embryonic stem (ES) cells, but reports that its loss has little effect on developmental gene activation during differentiation. 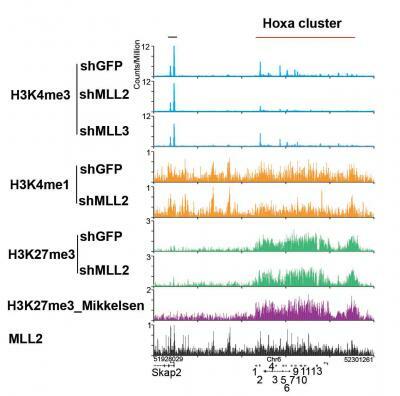 This suggests that there is more to learn about interpreting histone modification patterns in embryonic and even cancer cells. "There has been a lot of excitement over the idea that promoters of developmentally regulated genes exhibit both the stop and go signals," explains Shilatifard. "That work supports the idea that histone modifications could constitute a code that regulates gene expression. However, we have argued that the code is not absolute and is context dependent." Shilatifard has a historic interest in gene regulation governing development and cancer. In 2001, his laboratory was the first to characterize a complex of yeast proteins called COMPASS, which enzymatically methylate histones in a way that favours gene expression. Later, he discovered that mammals have six COMPASS look-alikes — two SET proteins (1A and 1B) and four MLL (Mixed-Lineage Leukaemia) proteins, the latter so named because they are mutant in some leukaemias. The group has since focused on understanding functional differences among the COMPASS methylases. The role of mouse Mll2 in establishing bivalency was the topic of the latest study. The revelation came when the researchers evaluated behaviours of Mll2-deficient mouse embryonic stem cells. First, the cells continued to display the defining property of a stem cell, the ability to "self-renew," meaning that genes that permit stem cell versatility were undisturbed by Mll2 loss. But remarkably, when cultured with a factor that induces their maturation, Mll2-deficient mouse ES cells showed no apparent abnormalities in gene expression. 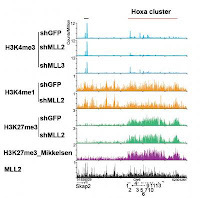 In fact, expression of the very Hox genes that normally exhibit bivalent histone marks was as timely in Mll2-deficient cells as it was in non-mutant cells. "This means that Mll2-deficient mouse ES cells that receive a differentiation signal can still activate genes required for maturation, even though they have lost the H3K4me3 mark on bivalent regions" says Deqing Hu, Ph.D., the postdoctoral fellow who led the study. "This work paves the way for understanding what the real function of bivalency is in pluripotent cells and development." The study's findings also potentially impact oncogenesis, as tumour-initiating "cancer stem cells" exhibit bivalent histone marks at some genes. "Cancer stem cells are resistant to chemotherapy, making them difficult to eradicate," says Hu. "Our work could shed light on how cancer stem cells form a tumour or suggest a way to shut these genes down." Researchers from the Gene and Stem Cell Therapy Program at Sydney's Centenary Institute have confirmed that, far from being "junk", the 97 per cent of human DNA that does not encode instructions for making proteins can play a significant role in controlling cell development. And in doing so, the researchers have unravelled a previously unknown mechanism for regulating the activity of genes, increasing our understanding of the way cells develop and opening the way to new possibilities for therapy. Using the latest gene sequencing techniques and sophisticated computer analysis, a research group led by Professor John Rasko and including Centenary's Head of Bioinformatics, Dr William Ritchie, has shown how particular white blood cells use non-coding DNA to regulate the activity of a group of genes that determines their shape and function. The work is published today in the scientific journal Cell. "This discovery, involving what was previously referred to as "junk", opens up a new level of gene expression control that could also play a role in the development of many other tissue types," Rasko says. "Our observations were quite surprising and they open entirely new avenues for potential treatments in diverse diseases including cancers and leukaemias." The researchers reached their conclusions through studying introns — non-coding sequences which are located inside genes. As part of the normal process of generating proteins from DNA, the code for constructing a particular protein is printed off as a strip of genetic material known as messenger RNA (mRNA). It is this strip of mRNA which carries the instructions for making the protein from the gene in the nucleus to the protein factories or ribosomes in the body of the cell. But these mRNA strips need to be processed before they can be used as protein blueprints. Typically, any non-coding introns must be cut out to produce the final sequence for a functional protein. Many of the introns also include a short sequence — known as the stop codon — which, if left in, stops protein construction altogether. Retention of the intron can also stimulate a cellular mechanism which breaks up the mRNA containing it. Dr Ritchie was able to develop a computer program to sort out mRNA strips retaining introns from those which did not. Using this technique the lead molecular biologist of the team, Dr Justin Wong, found that mRNA strips from many dozens of genes involved in white blood cell function were prone to intron retention and consequent break down. This was related to the levels of the enzymes needed to chop out the intron. Unless the intron is excised, functional protein products are never produced from these genes. Dr Jeff Holst in the team went a step further to show how this mechanism works in living bone marrow. So the researchers propose intron retention as an efficient means of controlling the activity of many genes. "In fact, it takes less energy to break up strips of mRNA, than to control gene activity in other ways," says Rasko. "This may well be a previously-overlooked general mechanism for gene regulation with implications for disease causation and possible therapies in the future." Researchers at the University of California, San Diego School of Medicine report a simple, easily reproducible RNA-based method of generating human induced pluripotent stem cells (iPSCs) in the August 1 edition of Cell Stem Cell. Their approach has broad applicability for the successful production of iPSCs for use in human stem cell studies and eventual cell therapies. The generation of human iPSCs has opened the potential for regenerative medicine therapies based on patient-specific, personalized stem cells. Pluripotent means that these cells have the ability to give rise to any of the body's cell types. The human iPSCs are typically artificially derived from a non-pluripotent adult cell, such as a skin cell. They retain the characteristics of the body's natural pluripotent stem cells, commonly known as embryonic stem cells. Because iPSCs are developed from a patient's own cells, it was first thought that treatment using them would avoid any immunogenic responses. However, depending on methods used to generate such iPSCs, they may pose significant risks that limit their use. For example, using viruses to alter the cell's genome could promote cancer in the host cell. Methods previously developed to generate integration-free iPSCs were not easily and efficiently reproducible. Therefore, the UC San Diego researchers focused their approach on developing a self-replicating, RNA-based method (one that doesn't integrate into the DNA) with the ability to be retained and degraded in a controlled fashion, and that would only need to be introduced once into the cell. Using a Venezuelan equine virus (VEE) with structural proteins deleted, but non-structural proteins still present, the scientists added four reprogramming factors (OCT4, KLF4, SOX2 with either c-MYC or GLIS1). They made a single transfection of the VEE replicative form (RF) RNA into new-born or adult human fibroblasts, connective tissue cells that provide a structural framework for many other tissues. "This resulted in efficient generation of iPSCs with all the hallmarks of stem cells," said principal investigator Steven Dowdy, PhD, professor in the UC San Diego Department of Cellular & Molecular Medicine. "The method is highly reproducible, efficient, non-integrative – and it works."